The most common kitchen countertop, laminate is a synthetic material made up of several layers. Though economical, laminate doesn’t have the lasting power of stone; however, our manufacturers offer upgraded high-wear surfaces with increased lifespan. The superman of stone, quartz surfacing provides a nearly indestructible material, idea for homeowners who want a beautiful surface. Providing the look of natural stone with a mettle that laughs in the face of coffee, lemon juice and high-maintenance care, its non-porous nature protects against more than just stains-it’s also extremely hygienic, making it a food-safe choice. Because it’s smooth and cool to the touch, marble is the traditional favourite for rolling dough and making pastries. However, it lacks the durability of granite and requires sealants to be applied more requently to prevent stains. Corian is a patented blend of high performance acrylic and natural minerals solid surface material that allows for seamless joins, non-porosity, hygienic surfaces, stain resistance and thermo formability. It comes in ninety colours in matt, semi-gloss and high-gloss. There are sinks that can be chosen and incorporated with the benchtops to provide for a seamless finish. Corian comes with a ten year DuPont warranty on product and installation. Stainless steel is still quite a popular choice. 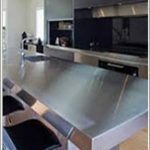 It is a durable surface and offers practicality and good looks, but Stainless Steel starts scratching from the day it is installed! After a while all these light scratches ‘blend’ into each other and the bench top once again looks great. It is a cold looking (and feeling) bench top, but extremely hard wearing.